Japan Expo staff has made it possible for anyone to send their questions to CLAMP to be answered in their public conference at the event (similar to what was done for Anime Expo in 2006). The event’s official website has more information on how to submit your question (basically you must fill a form). The deadline is May 15. They have also announced the day of CLAMP’s first public conference: Saturday, July 4. LOL at their first question example: When the X series will be finished? I so wanna hear them answering that question for the thousandth time (and it’s the thousandth time and is even bolder, Teddy Picker, love this song xD). Give it your best shot and ask away! More updates from CLAMP’s visit to the 10th edition of Japan Expo in France, Paris this July. 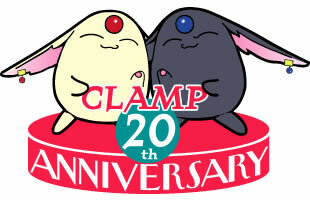 Following their activities as Guests of Honor, the event’s official website announced that CLAMP will give two sign sessions. Details of dates and hours of the sign sessions will be announced soon. Other activities of CLAMP in the 4 days of event include two public conferences and a CLAMP Cosplay Contest as judges. The official website of Japan Expo reports that CLAMP will be making two public conferences during their attendance. Busy days for CLAMP at the event, they are also planned to participate as judges of the special Cosplay Contest of CLAMP characters. Details of dates will be given soon. Japan Expo will be held in Paris, France, from the 2nd to 5th of July. I wonder if one can participate of both conferences, or I wonder if the Cosplay Contest is a plus (probably), not one of these two public appearances. The first activity of CLAMP at the Japan Expo has been announced today by the event’s official website: to judge a Cosplay Contest! There will a special Cosplay Contest of CLAMP characters and the winners will be chosen by CLAMP themselves! More details as they come! If you plan to participate, keep an eye on Japan Expo’s website for instructions. Thanks for letting me know, zero_no_tsubasa! CLAMP will land in Paris, France next July/2009! They will be Guests of Honor of the 10th edition of Japan Expo, which will happen from 2 to 5 of July. The information comes from the event’s official website. undini-sama scanned everything “CLAMP” available in this month’s Newtype magazine, and that includes the 20th Anniversary article, Kobato. Drop. 12-B and Satsuki’s column. They are all here, make sure to check them out! Unexpected appearance in Kobato.! 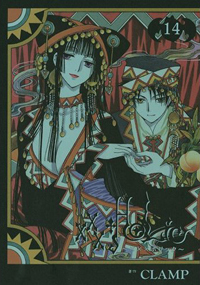 In addition, the cover of XXXHOLiC #14 has finally made an appearance on Amazon.co.jp (thanks clamp_now for the info!). This is the first time both Yuuko and Watanuki appears on the front cover since volume 1. XXXHOLiC #14 goes on sale on the 17th.